Coastlines - For all their dramatic headlands, valleys and intimate coves, they are an ancient testament to the tireless power of the ocean and its ability to shape landscapes and its people. 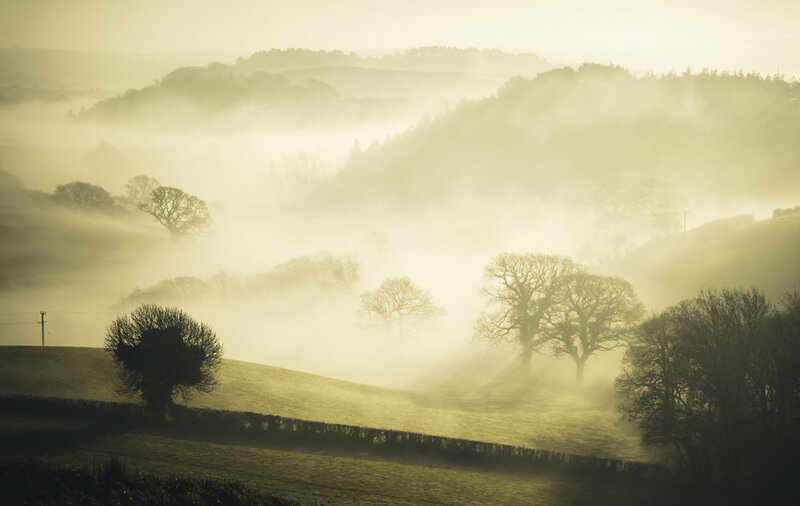 After years serving as a Royal Marine Commando in Devon, I’d never set eyes on the area I was set to walk and photograph. As I ran my fingers over an old dog-eared map on a coffee shop table, this area of the South West Coast Path (SWCP) appeared to be wild, rugged and untamed. The 60-mile section I was set to traverse was pinched between the fishing villages of Beesands, Bantham, Mothecombe and the stunning Salcombe, a town set on the steep banks of an estuary inlet near Kingsbridge. Since I can remember I’d grown up with dogs. From Golden Retrievers as a boy, to a pair of Black Labs to Spaniels, my home was always filled with their friendly, often cheeky presence. My father Steve was a fisherman, beater and outdoorsman. The dogs were his loyal companions for most of this time, sometimes trained, sometimes untrained. In their home pictures of gun dogs hung on the walls, small brass carvings of Labradors sat on the mantle piece. My parents would walk together with the dogs, an act that brought them close together, and whenever I would be there, I would join them over the hills, in the forests and on the beaches. The family dog was a key aspect, possibly a central pillar, to our family life. I couldn’t imagine a time or a memory without one of them there. For this journey I partnered with Forthglade, Devons premier natural pet food. Established in 1971 their approach, ethos and product are to deliver the highest quality pet nutrition using 100% natural ingredients. Our aim for this partnership: To walk this wild stretch of coastline over 5 days to document an authentic account of the relationship between people, their dogs and nature. For someone who is used to the high mountain landscapes or the running current of a wild Alaskan river, this project would be one of personal and local connection to huge aspects of not only my upbringing but also my career: People, dogs, landscape, photography and storytelling. My first steps on this wild journey began in the small fishing community of Beesands. The night before I spent time with the owners and managers of the beautiful restaurant and hotel, The Cricket Inn. Rachel, Nigel, Sally and Stuart had sat and shared funny and moving stories of family Labradors past and those of the newer, younger arrivals. Buddy, their newest addition eagerly greeted me and those that entered the pub. Rachel shared “The interaction with people, the conversations and the connection, when you’re out with your dog, it’s incredibly rewarding”. At the juncture of my first evening full of conversation, I was sad to move on. Sprawling miles of rolling landscape lay waiting. As the sun rose overhead and began to soften in the southern sky I’d covered nearly 18 thigh crushing miles on the first day. During that time the South West Coast Path had ducked and weaved past lighthouses and coastguard lookout centres aloft weather beaten outcrops. The soundtrack to my day had been the waves shaping the shoreline and the seagulls on their daily aerial assault in squadrons above me. I’d met a couple with 3 spaniels on their yearly jaunt to complete, in sections, the full 630 miles of the SWCP. The two caramel and one black Spaniels ran double what they walked. Their natural inquisitive instincts as dogs taking them up hills, between cracks in rocks, smelling, inquiring and returning to the soaring pitch of the dog whistle. The hour of walking and talking about the bond between humans and dogs that goes back thousands of years gave me a fresh insight into how the relationship is still as strong as it was when we began to domesticate dogs all that time ago. “It seems the bond becomes more and more powerful with every activity you do together” Says Jennifer Gosselin. I can only imagine how this strengthens and solidifies over time. Leaving the safe and blissful harbour of Salcombe the following morning my route seemed to be bathed in early morning sunshine and cotton wool coastal mist. This section would take me through gentle forested hillsides that overlooked the estuary inlet. After hours of steep inclines, past picture postcard homes and ancient jaw dropping peninsulas I was met by the Forthglade film team alongside Chester, a young excitable Vizlsa. 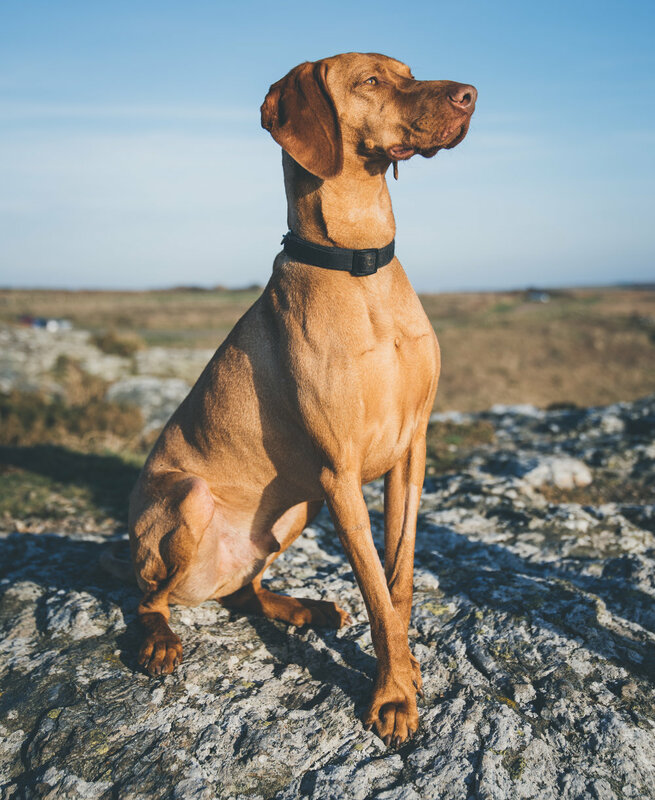 For the next few hours we put together the basis of a short film to support the project which would showcase the vast and rugged Devon terrain alongside the main reasoning of the project; to learn about our connection to dogs & nature. As we said good bye the sun and sky began melting into a pastel orange and grapy purple palette. With 6 miles to go, soon it would be dark. As an adventure photographer this is my time, when the light becomes its softest and most saturated. Today the camera was stowed away, wrapped in a jacket. From here hiking shoes were replaced with running shoes. I ran the remaining distance along the coast to Bantham, arriving into my lodging just after dark. I made my way to the ripped and warn red leather sofa by the wood burning fire, its flicker and crackle putting the day into perspective. As the morning mist cleared, I stood at Bantham quay, I had no way across the estuary. It was February and the ferry was closed. After a short yet thoughtful conversation with an owner and his Husky, I scouted the village and found local fisherman and legend Pete, who helped row me across the calm waters after his morning caffeine in the local coffee shop. As soon as my feet touched the far shore sand, I was off, lungs heaving, thighs burning into the altitude of the coastal path. One owner, seeing me resting my feet, came to me with a satsuma and a warm embrace from her brown and white Cocker Spaniel. As our chat drifted to the nature of our project she shared stories of her mother and how the act of walking her dogs along the coast had helped her with loneliness, depression and dementia. Maybe I subconsciously knew anyway, it seemed dogs anticipate and understand our moods and how our reaction to them can help us not only mentally but physically improve our state of wellbeing. “By watching them explore the world, you also get another perspective of your surroundings and on life. It’s a good reminder to live in the present moment” – Says Jennifer Gosselin. After arriving into my final location that evening at Mothecombe, I’d battled another smaller estuary and crossed its waters up to my shoulders before arriving at the Coastguard Cottages. These beautiful buildings overlooked the sweeping tidal bay I’d crossed earlier. “Adventure is what you make it” I told myself as I remembered the frigid coastal waters numbing my feet and annoyingly soaking my tuna and mayonnaise sandwiches. Before my journey back to Beesands early the following morning I met with Maria and her greyhounds on the beach below the cottage. She was the daughter of one of my neighbours. As we walked on the sand, the tidal water spiralled in miniature over the rippled shapes left by last night’s high tide. The mist and rising sun illuminated this idyllic valley playground for the dogs, I was privileged to be up at this exclusive time of day with Maria. As we walked and chatted in the crisp February air, I felt the connection between people that dog owners mention from time to time. It seemed that not only is the relationship between dog and owner symbiotic, walking them is a healing activity that connects people to others on a human level, as well as to the dog themselves and ultimately to the natural landscape around us. Whether the conditions are not so favourable, or locations vastly different, there is still something to be said about the act of walking with your dog in nature. It’s an activity that bonds and helps both owner and animal in ways that go beyond what you can feel or touch. As I watched the Devon landscape drift quickly from my car window, I realised one thing is for certain, that the impact of dogs on our lives is massive. They encourage us to explore, to get out, to forgive and be resilient. Most of all they own their own unique personalities, teaching us their own lessons, about friendship, perspective and above all, life.